I came home smiling. Life treated me well for a Monday. I walked through the door, tossed my keys on the island and looked into the dining room. There sat a strange six-year old, not moving a muscle. Since I don’t own a six-year old who doesn’t move a muscle, I looked for the right kid. He wasn’t there. “Look!” said my husband. Next to my keys sat a pile of papers the size the size of Texas. There was a “for sale” sign on the front lawn. It appeared we’d be moving to a larger state to accommodate the pile, it wouldn’t fit in Rhode Island. Rusty dealt out the papers, one by one, a casino hand where every one’s a loser. Notes in red. Weeks of behavior charts. Smiley faces turned upside down. Declan the Clever had been hiding papers since January. Every once in a while, he brought one home to avoid suspicion. His teacher had returned from leave. He took the Changing of the Guard as an opening to end homework. I should’ve felt the fish-hook tugging my cheek–I believed his lines. “No homework today!” he’d say. “Isn’t it math day?” I sent a note I’m sure failed to arrive. He needs a bigger desk–perhaps something in executive mahogany–to fit hidden homework and excuses. As a mom, I’m angry about this. My kid lied and outwitted two parents, one a professional educator specializing in kids who outwit the system, and the other a former military police investigator. And he outwitted the system itself. That’s a lot of deliberate lying. At least two hundred counts of Lying in the First Degree. As a professional educator, I’m pretty impressed, though. Amazed even. That’s spirit! That’s entrepreneurship. That’s planning, organization, and flawless execution. Companies are built on such skills. I once worked with a kid who was incarcerated. “Miss, I already have my GED. I want to learn genetics.” I taught him what he wanted to learn. He worked hard. One day, I asked, “Why are you in here?” He was a happy kid. A smart kid. Turns out, the first time he was in trouble, he’d noticed a police car during a drug raid. He stole some things, including the drug raid schedule then sold information to people about to be arrested. Genius! At 12. I’d have charged the officer with stupidity, and found the kid a mentor. Instead, this kid–with a substance abusing mom and a gang-affiliated dad–started his life-long career in the system. He never had a shot to use his genius for good. I look at my kid. The only difference between Declan and that boy–environment. A mom and a dad who sit him under the pile of papers, and make him make it right. Then hope for the best. The evil genius–exactly the same. The challenge is how to channel that–to make it work for him instead of against him. I don’t want him to be “that kid” who when teachers get their rosters in September, they subliminally feel, “Oh…” with a sinking feeling they’re not going to have a good year. Part of my mission teaching–the reason I changed careers–was to love “that kid.” That’s not always the way it always works in education. I never thought I’d be the mom of “that kid.” His school is marvelous. I still need to nip this in the bud. I’ll get him a PR firm and modify his behavior before it’s too late. I don’t want him stealing things out of police cars learning genetics in jail. “Why’d you do it, buddy?” I asked the little boy not moving a muscle. He was pressing his pencil hard on a math problem, frowning. “Because I don’t like homework. It’s dumb.” Parents know–when kids have homework, we have homework. I pulled up a cup of tea and a chair. I settled in for a long week of first grade math. “You’ve got a lot there,” I said. “Yeah.” He scribbled “DECLAN” on a paper. He smiled. His pencil burned through paper after paper. He put each in the victory pile and raced for the next. He worked. I cheered. Months of homework done in one night. I’m not sure what the lesson is. Homework’s a pain? Evil geniuses outwit adults? Parenting’s tough? 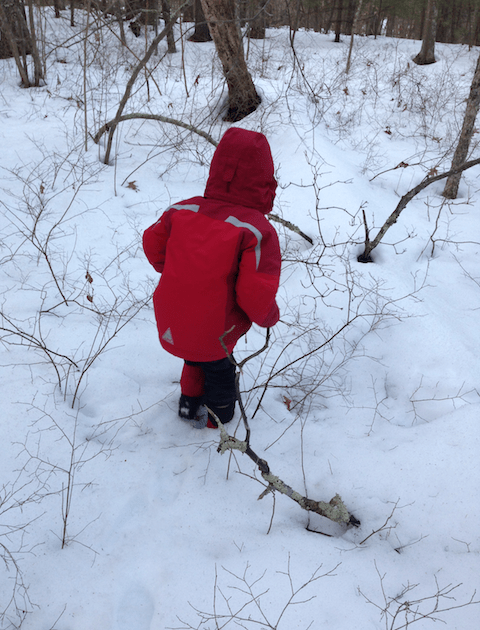 Or finding the right motivation–even a simple hike in the woods–is to unlock a child’s heart? We went for our hike as the sun faded into the trees. We followed our tracks back to the house. 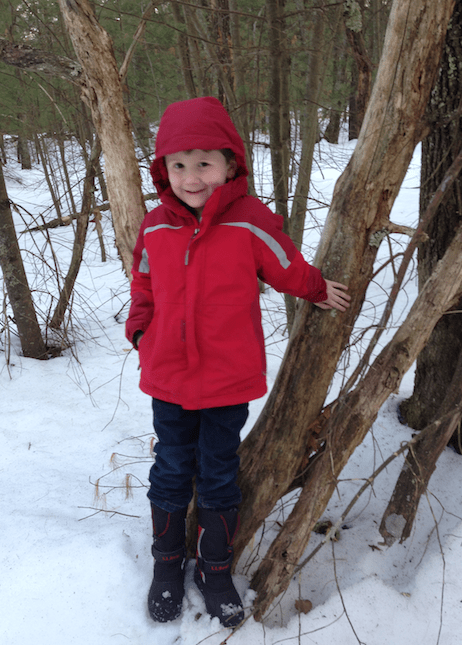 Wild creatures didn’t eat us, and the boy smiled and jumped around. The boy who didn’t move a muscle was gone.